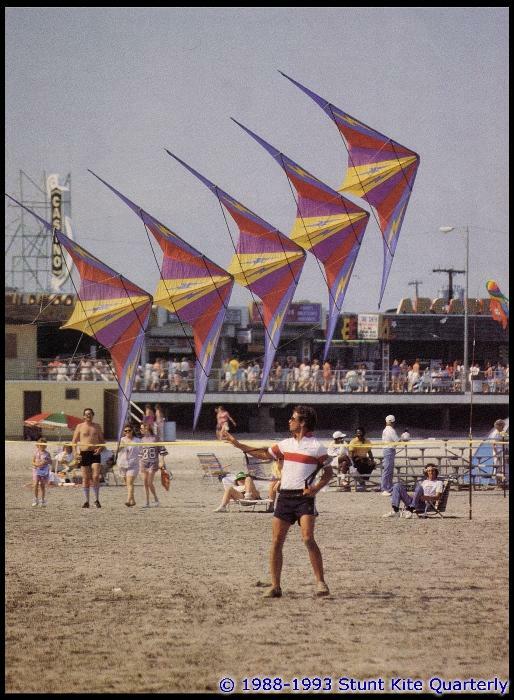 As the sport kite scene was coming into it’s own in the late 80’s, many of the more creative fliers found a new venue in which to demonstrate their ideas… Innovative competition. Complete with props, costumes, kites and a more than a little showmanship, pilots tried everything from flying multiple kites to dogstake/solo flying, riding unicycles, and much more… Free of the constraints inherent to traditional ballet competitions, Innovative proved to be the testing ground for many of the flying innovations that are part of our lives today, and also provided pilots with a more fertile outlet for their creativity and personality. As many of these styles became more predominant and widely used, we began to see less and less original concepts – giving the American Kitefliers Association cause to eventually change the discipline’s name to Freestyle, in light of a lower frequency of true innovations. Now, that’s just basic break down of Innovative’s history… But doesn’t really address what it had to offer our sport… In the past or even today, for both spectators and performers. Fliers marked with * are those who I’ve heard have been known to do more, but these numbers are based on the performances I’ve actually seen myself. 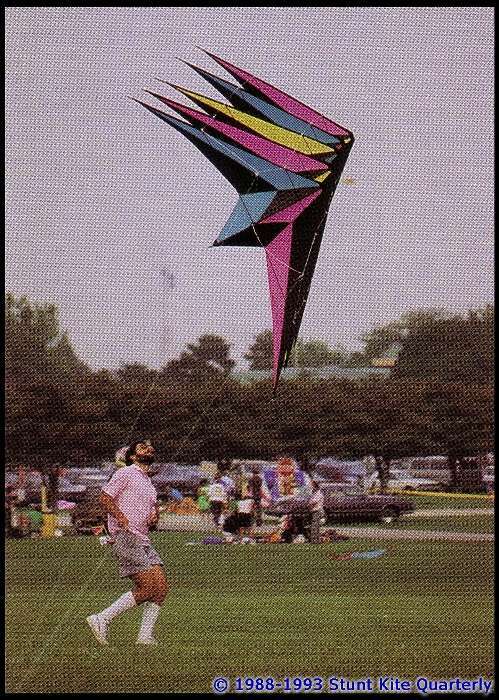 The most skilled of these have also been able to not just fly their kites in synchronized loops and wraps, but also some of the rudimentary team maneuvers such as threads and weaves. 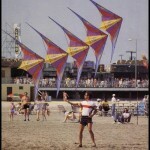 Scott Aughenbaugh flying four kites! 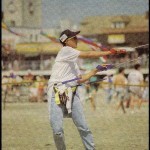 Jason Loo flying two kites. 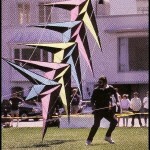 Another variation includes a combination of dual and quad line kites, with the dual line kite being flown from one’s waist and the quad by hand. 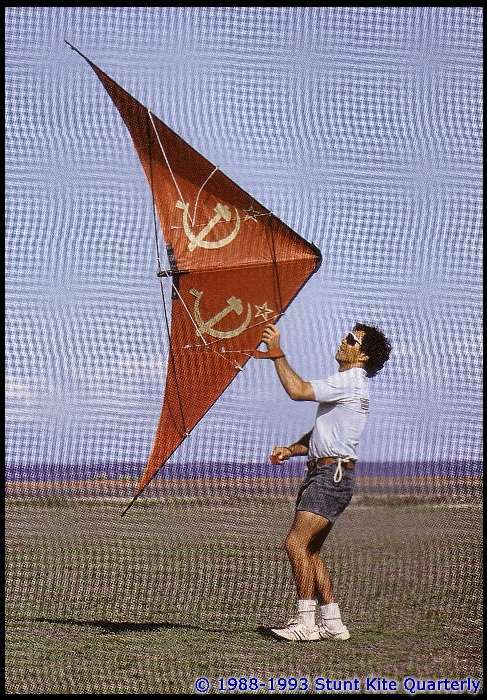 One flier even managed to fly three quad line kites at once… Roger Maddy first started with three Revolutions and eventually moved on to his own design, a single kite with 12 lines controlling it. 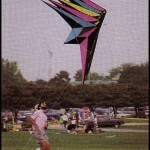 As of today, only 2 or 3 fliers are still regularly practicing and performing multi-kite flying in North America. I would consider this a “hard skill”, or true innovation that required a unique ability. 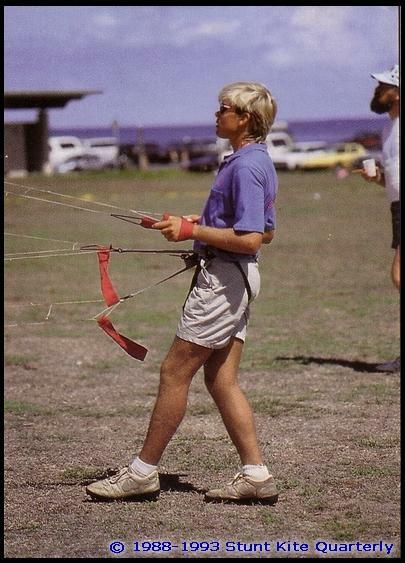 As a natural process in the early love affair with sport kiting, “solo flying” was created, by which a pilot would run their lines through a ground stake enabling them to stand downwind with their kite, interacting with it first hand. 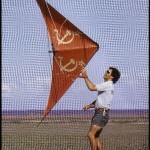 Malcolm Moore using a USA/USSR kite theme. Lee Sedgwick at play with his Revolution. Brian Vanderslice baring his soul via dogstake. 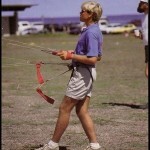 Eric Wolff flying a dual line 5-stack of Firedarts. Eric Wolff dogstaking again with his Firedart stack. 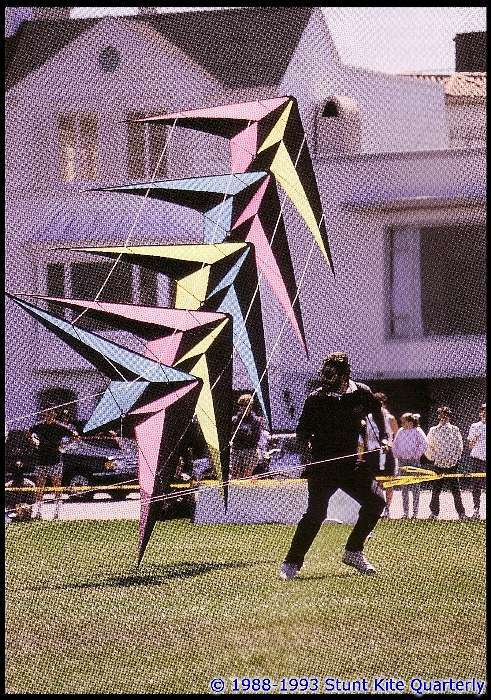 Introduced near the same time, quad line configurations became ideal for solo flying due to their ability to slow down and land with ease… This naturally made it easier for pilots to interact with their kites. I would also consider this a “hard skill”, or true innovation that requires a unique ability and good amount of practice. 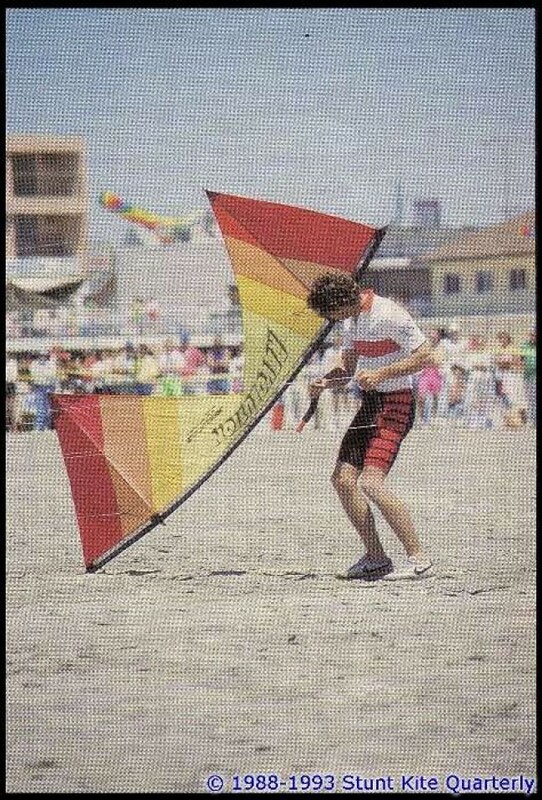 Another innovation which was introduced some time in the early 90’s, 3D flying involved putting a Revolution kite on short lines (15′-20′) which made it possible to quickly pull on the top lines and send the kite sailing toward the pilot for a spectacular catch, then a toss back into the sky… Variations on this might be compared with frisbee, such as jumping over the kite, catching behind the back, under a leg, etc. 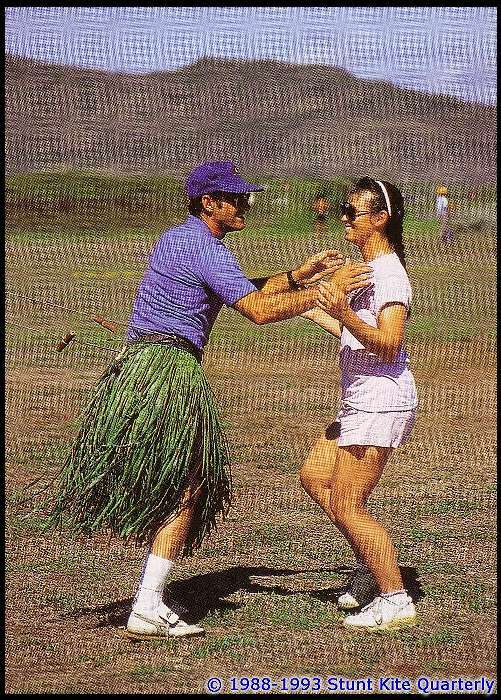 Albeit somewhat short-lived, this technique was very popular for a couple of years, and is mostly credited as being pioneered by Lee Sedgwick… Although David Brittain is also acknowledged as having established many of the more stylish catches and throws. Another innovative style involved a blend of martial arts and kite flying, where the pilot would dance around the lines, stepping over them, flying between their legs, as well as doing forward and backwards rolls and somersaults while keeping the kite in the air. 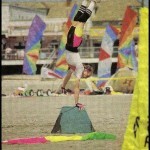 By far, the most recognized line jumper was a gentleman from Florida… Phil Castillo. This could be considered a Zen kind of flying, or “Kite-Chi”. Further utilizing the lines as part of their act, this skill entailed flying a relatively light pulling kite and reeling the lines in and out during flight so that one would start at the handles and eventually end up with the kite only a few feet away from the flier… Adding another dimension to the wind window, this was another interesting display when done with style. Probably the most accomplished line play pilot was Lee Sedgwick. 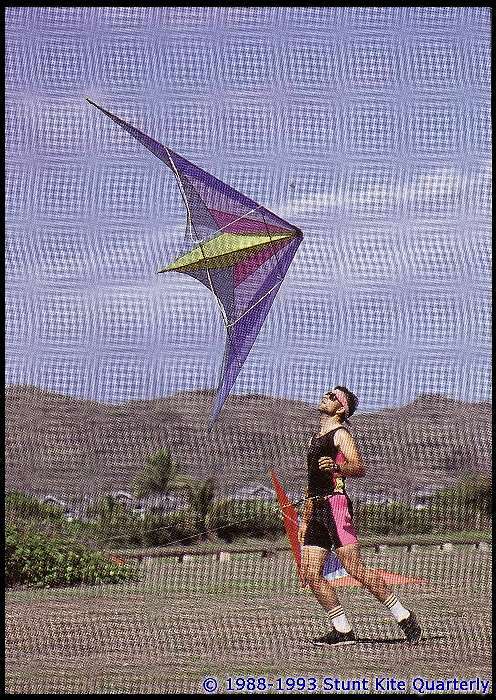 Talk about “flying blind”… Fliers who were very comfortable with the controls of their kite would sometimes don a blindfold for the length of their routine, doing as many of the normal maneuvers as possible using only the feel of the lines to know where the kite was flying. This skill has been incorporated by a large number of fliers over the years, with no single flier taking credit for the first attempt. This could also be considered a Zen kind of flying, or “Kite-Chi”. 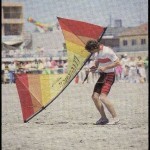 Sort of a “high noon” skill, this technique utilized the kite’s shadow and required the sun to be nearly overhead… As a pilot was flying, they would turn around and face upwind, looking for the kite’s shadow on the ground and “flying” it around their body. 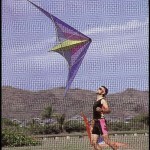 This could be considered yet another Zen kind of flying, or “Kite-Chi”. 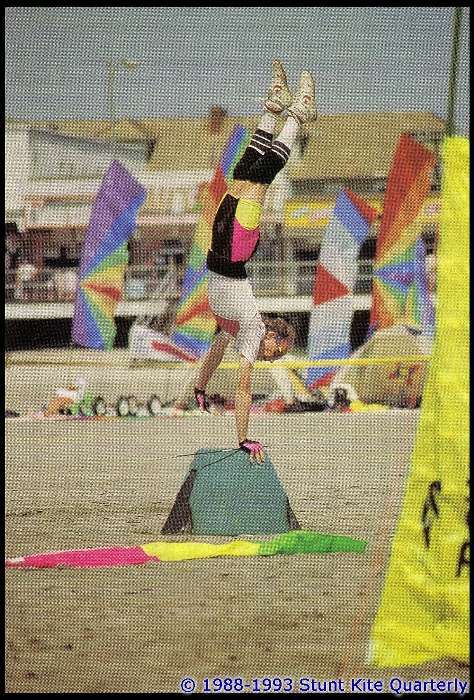 Another skill that came into play with a select few pilots were gymnastic, tumbling or acrobatic displays… Sometimes utilizing tools such as a frisbee, ribbons, pedastals, unicycles and more. One of the most recognized names from the realm of innovative flying would be Gary Counts. 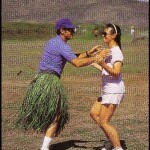 Aside from actual flight innovations, the most common trait of innovative routines was some kind of theme or story that brought it all together, something more along the lines of a mini stage performance, providing a storyline that connected the flying with the pilot… A good example would be Ron Reich’s old Hula routine, where he’d put on a grass skirt and dance with his team mate Pam Kirk… The hook was, he’d also have his lines attached to his hips at the same time, and be flying the kite behind him. Another fun one was Pete Dolphin’s routine to ZZ Top’s Sharp Dressed Man, where he set up a guitar to swivel on his belt, attached a line to each end, and flew his whole routine while playing “air guitar”… Occasionally he’d give the guitar a spin, stop it, and continue flying. The last example I’ll use here is the routine I created using a latex wolf mask, dogstake and Little Red Riding Hood music… Just something to give a “hook” to your performance. So, these are really just a few of the basic and most recurring techniques we’ve seen in Innovative/Freestyle events over the years… The ideas and in depth productions extend well beyond this, saved for another day, another article. But back to the issue at hand, what happened to all the entrants in this discipline? Where as during the late 80’s and early 90’s it was not unusual to see 10 or more competitors in the discipline, we’re now lucky to see even 3 or 4 at any major event in the USA. With such a potential for expanded performances and greater creativity, why aren’t people taking part? Granted, some of the formats that have been used could be a little embarrassing these days, I think it’s a measure of style that determines the show-sense of this event. I call to those of you who are performers or competitors, realize the show you have to offer… Every bit of variety and innovation is another step not just towards more for us, but more for our spectators. This entry was posted in 2005, Competition, General Topics, Issue 42 (May/Jun), KL Archive and tagged compeitition, freestyle, innovative.